My husband Dave is a man of many talents, including creating 3D models of stuff using Google SketchUp (click link to download for free!). He's used it to create the model for our kitchen counter project, our hoophouse, and now the outdoor oven. This model was really helpful in visualizing what we were doing, and also helped us think about how big to make the oven. We also wanted to be able to use the oven to bake bread, and we decided a two-loaf capacity was right for us (note that bread and pizza are not cooked at the same time). The inside of the oven (the cooking area) is dome-shaped, so we needed to know the diameter of the smallest circle that could contain a ring of fire + a medium pizza (or a ring of hot coals + 2 bread loaves). We settled on a 45" diameter, then cut it out in cardboard and played with it for a few days...put it on the ground at the site we'd chosen, put pizza crusts on it to try it out, etc. We were worried that it was a little too small, but the big advantage to keeping the oven as small as possible is that smaller = much better in terms of heat efficiency and consistency. As it turns out, we typically use about 2 logs* on any given pizza night (that will make about 8 medium pizzas and then, when the oven cools off a bit, two loaves of bread). We're REALLY pleased with the size we chose. *The logs are split into kindling, and Dave tends the fire for about 30 minutes, at which point the temp in the oven is about 700 degrees, and the mass (the dried adobe) has absorbed that heat pretty evenly. A bigger oven would require more wood and would be harder and time-consuming to come to temperature and stay there without forming hot and cold spots. we're going to use it a guide to build a cob oven in our new house. i was wondering whether you would be able to make the sketchup file available for download? i'd be really interested in seeing it. This is really ambitious. 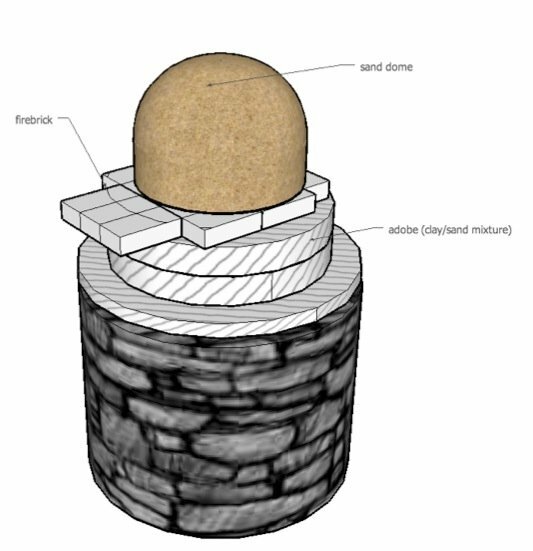 I like reading the process from start to finish about you building your pizza oven. There's a lot that goes into it without really knowing! I tried something similar in the past, but I got hung up on the whole location aspect of it... I ended up just opting for commercial pizza ovens (right out of the box, so to speak). Luckily I opened a Pizzeria and it's been going strong since! Anyways, nice blog/post. Keep it up! Hey thanks for the site - great resource! So, I am going to build an oven at a church property, and don't want to have one that takes forever to heat up or forever to cool down, as we will only be using it about once every 3-4 weeks. You guys say yours takes only 30 minutes to heat up - sounds perfect! Wow very nice post its all information is really very nice and useful for me and other users. Great post. Thanks for sharing. Don't miss to checkout our Composite Curing Ovens . Thank you for posting such a simple and yet detailed step by step!! I'm building one in VT and this is perfect.